Do not listen to Turner's vindictive and spiteful review of this film. This is a life affirming fairy tale of the power of music and love with an excellent story,acting and music. Anyone with a heart will love this film. Cold fishes and cynics like Turner need not bother. Matthew Turner's disgraceful and spiteful review of August Rush can not be left to go unchallenged. I can only assume Turner is a cold hearted and cynical man who sat watching this film with fellow disbelieving and cynical film hacks. they must be unable to suspend disbelief and being a critic that is what they do best, criticise. They offer nothing constructive to anyone's lives. However Turner, contrary to your absurd review the film is an absolute joy from start to finish and is in my top 10 films of all time. The acting is superb as is the story. It is a life affirming fairy tale about the power of music and love, something that went completely over Turner's head. I can only assume Turner watched this film with a bunch of macho males. You have to take coincidences in good faith but the pay off in the end is well worth it. Also Turner the slagging off of Williams is tired and lazy and utterly predictable. YAWN. Anyone reading this , disregard Turner and watch without prejudice. I do not feel angry with such a vindictive review of such a great film more sorry for Turner who clearly does not possess a heart. 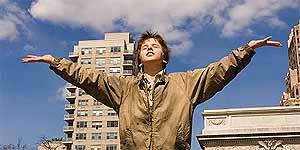 Matthew Turners disgraceful and spiteful review of August Rush cannot be allowed to go unchallenged. I can only assume this man has no heart and is a cold hearted cynic worn down by watching too many films with fellow disillusioned and film weary cynical and emotionless hacks. The film is an absolute joy from start to finish. It is a modern day fairy tale something that seems to have gone over Turner's head. It is a life affirming celebration of love and the power of music. Yes you do have to accept coinicidences in good faith but the pay off is more than worth it. Also Turner, the slagging off of Williams is tired and lazy and utterly predictable. I can only assume you watched the film with a bunch of boozy macho males. Get over yourself and try to give a balanced review of films in future. The music is superb as is the acting and the story and many many people agree with me. I do not feel angry at your vindictive review more sorry for you that you do not have a heart. I don't agree with Matthew Turners review, August Rush isnt amazing but it's not that bad!! Its a cute film - ok it takes itself a bit too seriously but its not overly sappy.